NEW YORK CITY (Oct. 17, 2018): WBC, WBA, Lineal and Ring Magazine Middleweight World Champion Canelo Alvarez (50-1-2, 34 KOs) and Golden Boy Promotions hosted a press conference today at Hulu Theater at Madison Square Garden to announce a historic five-year partnership that they have signed with global sports streaming leader DAZN. 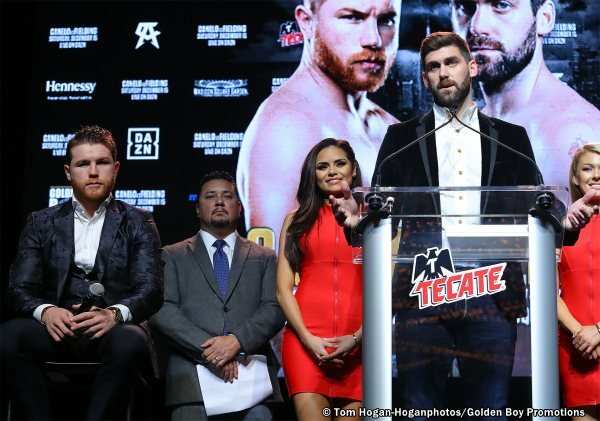 This exciting partnership begins when Canelo challenges Rocky Fielding(27-1, 15 KOs) for his WBA Super Middleweight World Title in a 12-round main event on Saturday, Dec. 15 at Madison Square Garden. As part of the partnership, Golden Boy Promotions will put on up to 10 high-caliber fight nights per year that will stream live on DAZN beginning in early 2019. This groundbreaking deal with Canelo will be the richest athlete contract in sports history. The historic deal marks a major change in the boxing landscape, where its biggest stars traditionally fought on pay-per-view. Now, sports fans can view Canelo's fights and the deep Golden Boy Promotions stable for a low monthly subscription cost. These fights will be available in all DAZN markets, including the United States, Canada, Italy, Germany, Austria, Switzerland and Japan. "There are no words to describe this. I'm so happy to be able to give great fights for less money. That was the biggest motivation for me when doing this deal. I'm happy about this new alliance with DAZN. I'm also happy to be making history by fighting at Madison Square Garden for the first time." "My recovery has been great. The cut is recovering. We haven't started sparring yet, but we will start soon. We will do more than 50 rounds of sparring like in every camp. This is a new challenge, to be moving up in weight. We'll see how the weight affects me. He'll be bigger and maybe even stronger than me. This is a risk that I am taking. I'm entering the comfort zone of the champion, but I'll take this challenge on because that's what I need to do to make history in my career. I want to be one of the top ten Mexican fighters to become a three-division world champion." "I went to Germany and fought for the world title. People wrote me off and didn't give me a chance. But I won the world title and it only took me five rounds. I worked my whole life to be on the biggest stages, and now I'm fighting the biggest name in the sport at Madison Square Garden. It is every fighter's dream. I know Canelo is an elite fighter. But I'm going in there as a champion to defend my title and walk away with the victory." "I want to tell you all a story. The date was June 24, 1968. I was still a child at that time. Mexico was paralyzed on that date. I remember it. They were attentive at the fact that Mexico had a world title challenger in the division of all divisions, heavyweight. On that night, Manuel "Pulgarcito" Ramos challenged Joe Frazier for the heavyweight title at Madison Square Garden. In the first round, Ramos hurt Frazier, and it looked like our hopes would come true. But in the following round, he was stopped and was badly hurt. The magic ended, and the hope ended. But on that day, I first heard the name of Madison Square Garden, and I will never forget it. Now that I'm here with the pride of Mexico, it is an honor for me." "We are very happy about the good news between Golden Boy and DAZN. On December 15 we have another important challenge before us. European boxing has been going strong and moving forward. They have great champions such as Carl Frampton and Anthony Joshua. We know that Fielding is strong and tough, and he's coming off a streak of good victories. We know it is a big challenge to be moving up to 168 pounds. He is a strong fighter who is well-schooled in the sport of boxing. But we want to make history. We want to let everyone know that Mexican boxing will always be the best." "It's a privilege to be in such an arena, the Mecca of boxing, Madison Square Garden. It's privilege to be able to share the ring with a great fighter like Canelo. But I believe I have the right type of fighter with me. He has all the attributed to give Canelo problems. 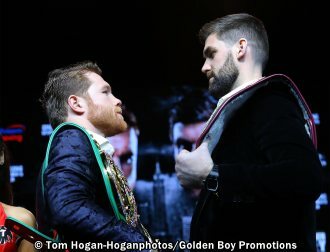 Canelo has never fought at super middleweight and he's never fought anyone with the size that Rocky Fielding has. Rocky has come along way. He has had setbacks, but they have taken him to where he is today. We will walk away with the victory on Dec. 15." "As we all know, the sport is undergoing an enormous change. We at Golden Boy Promotions have taken a major step forward to adapt to this change. That's why I'm happy to announce that Golden Boy Promotions and Canelo Alvarez have signed a historic partnership with the leader of sports streaming, DAZN. 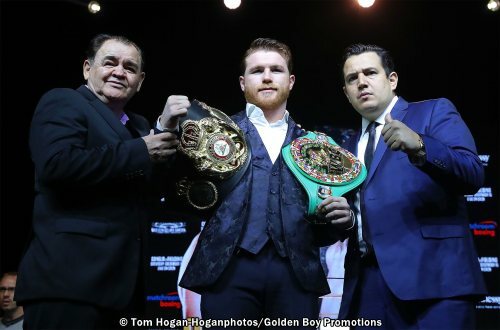 This is a direct and unprecedented partnership between two major global companies in the sport, Golden Boy Promotions and DAZN. As a Golden Boy fighter, Canelo became the undisputed pay-per-view king. But now Canelo is starting a new era in the sport by having his next 11 fights on this amazing platform." "Oscar De La Hoya, as a fighter and a promoter, has been the most important figure in the history of boxing on pay-per-view. Right now is the most important fighter on pay-per-view. Canelo has sold 3.6 million buys in his last 3 pay-per-views fights for a total subscription revenue of a quarter of a billion dollars. His next 11 fights will be available exclusively and internationally on DAZN." "This fight is a wonderful opportunity for Rocky Fielding. He always kept patient. He traveled to Germany to win the world title. He's always boxed everyone we've offered him. This is a golden opportunity for him. He comes in as the defending champion, but he's also blessed to fight at one of the best arenas in sports history." Canelo vs. 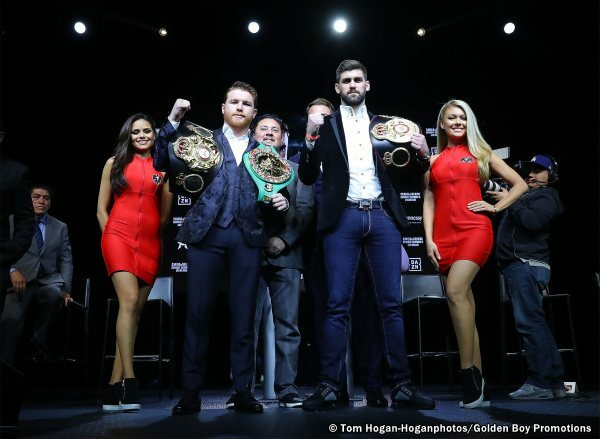 Fielding is a 12-round fight for the WBA Super Middleweight World Title presented by Golden Boy Promotions in association with Matchroom Boxing. The event is sponsored by Tecate, "THE OFFICIAL BEER OF BOXING," and Hennessy "Never Stop. Never Settle." The event will take place Saturday, December 15 at Madison Square Garden in New York City and will be streamed live on DAZN. Tickets for Canelo vs. Fielding are on sale and are priced at $1,000, $500, $300, $200, $150, $100, $75 and $50 plus applicable taxes, fees and services charges. Tickets can be purchased at the Madison Square Garden Box Office, all Ticketmaster outlets, Ticketmaster charge by phone (866-858-0008) and online at www.ticketmaster.com, www.goldenboytickets.com or www.MSG.com. and https://www.facebook.com/DAZNUSA/. 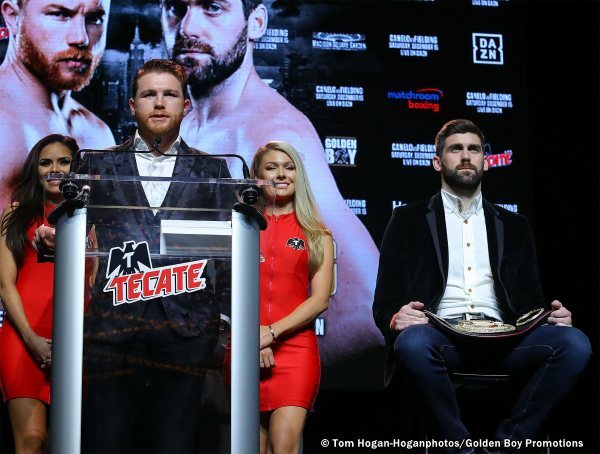 Follow on Instagram @GoldenBoyBoxing, @Canelo, @Rocky_Fielding, @MatchroomBoxing and @DAZN_USA. Follow the conversation using #CaneloFielding.